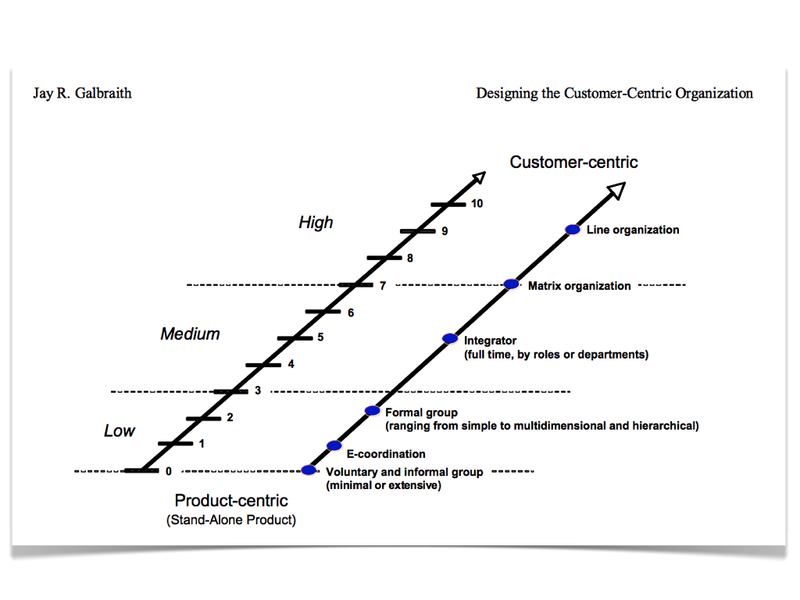 Is your organisation customer-centric? Do the quick Galbraith test! 1 point: My company has two to five similar products or services to sell to the same customer. 2 points: We offer five to ten mostly products and services. 3 points: We have ten to fifteen products or services of different types to sell to the same customer. 4 points: We have fifteen to twenty variegated products or services to sell to the same customer. 5 points: We have more than twenty products or services of various different types to sell to the same customer. 1 point: My company provides stand-lone products to the same customer with common invoice and billing (“one-stop shopping”). 2 points: We have a set of minimally connected stand-alone products (like a common brand, common experience, combined shipment). 3 points: We have minimally packaged (themed) components that need to work together for customer segments. 4 points: We have modular components of products and services that need to work tightly together as a system. 5 points: We have very tightly integrated packages/bundles/full solutions of products and services to offer the customer. STEP 3: Add your score from step 1 and 2 and plot this in the customer-centric strategy locator below. On the right of the graph you’ll find the most appropriate organisation structure. And, how customer-centric are you?